A day before the midterm elections, and the tensions and hostility surrounding America’s current political climate seem palpable. According to a recent poll on civility in politics released by campaign consulting firm 1st Tuesday Campaigns, 65 percent of voters said they’re dissatisfied with the tone and civility surrounding the political discourse in the country, and 67 percent feel the state of civility in U.S. politics has gotten worse in the last year. It seems the only thing Americans agree on anymore is the fact that we don’t agree: 69 percent believe Americans are now less tolerant of opposing viewpoints, and 45 percent said the political divide has made it harder for them to be friends with people who share a different viewpoints. Nearly three-quarters (72 percent) think the state of civility in the U.S. political debate is now doing permanent damage to our democracy. 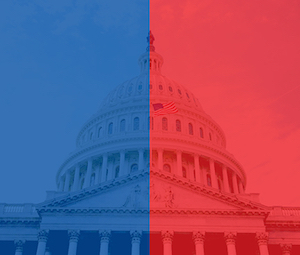 So, who’s to blame for America’s partisan divide? According to the 1st Tuesday Campaigns poll, two-thirds of voters (66 percent) place the blame squarely with our politicians. Coming in at second place was the news media, at 51 percent. More than a third (35 percent) blame social media, while 20 percent blame celebrities and 19 percent blame the public. Those who said they voted for Trump in the 2016 election were far more likely to blame the media (74 percent) for our divisive political climate, while those who voted for Clinton were more likely to blame politicians (77 percent). Nearly three-quarters of those polled (73 percent) believe the tone in Washington has made it difficult for politicians to pass laws. And an overwhelming majority of respondents (89 percent) said they want politicians to work across the aisle in a bid to address our country's current problems, even if it means not getting everything they want. However, more than half (52 percent) of those who said so admitted there are some issues for which leaders not compromise, particularly issues involving healthcare, immigration and terrorism. Once again, the poll bore additional findings once partisanship was taken into account: 73 percent of self-labeled “very conservative” voters and 64 percent of self-described “very liberal” voters believe there are issues for which compromise should not exist. Only 41 percent of moderates hold this view. 1st Tuesday Campaigns’ Civility Poll surveyed more than 1,500 U.S. adults in late October.